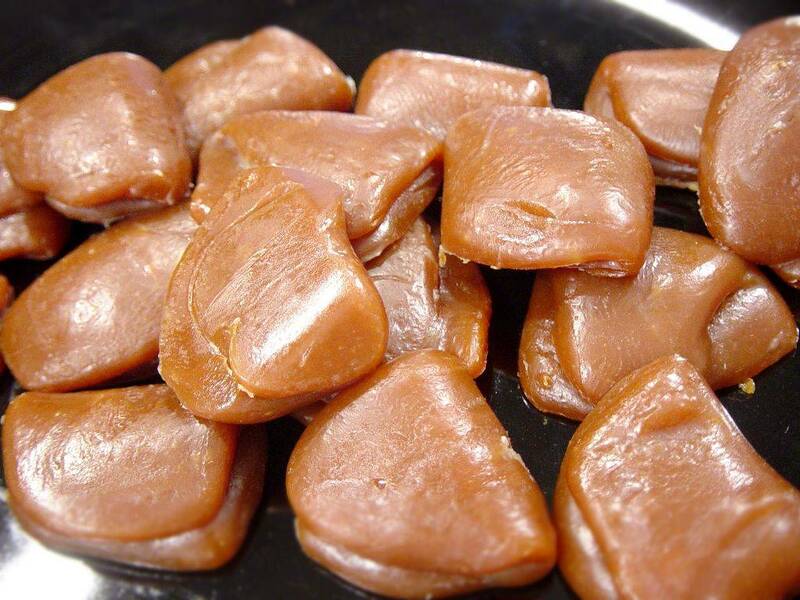 The best thing about homemade toffee/caramels, besides the taste, is that you can make them as soft as you prefer. Even soft enough that they won't pull out your fillings :-S Also, caramel sauce is amazingly popular for ice cream. I actually thought it was just kids who wanted it. Until one day I made it for the entire family ... this recipe good for both caramels and caramel sauce. Melt the sugar in a saucepan and cook until golden. The darker it gets the stronger the flavor. I usually melt only half of the sugar and add the rest after the cream. This provides a very mild taste. Add the butter and mix well with the melted sugar. Let it cook simmer for about 10 minutes. Cook until it forms small bubbles that sticks together and the mass becomes porridge like in its texture. If you have a meat thermometer use that. At 125°C (257°F) you will get soft caramels and a fudge-like texture and at 130°C (266°F), they will be relatively hard. I prefer the soft version. They are also easier to cut out when on the softer side. Pour the mixture into an oiled pan or molds, where they can cool off. It should be so cold that you can cut them without the caramels sticking right back together. But if you wait too long they get tough or brittle and becomes impossible to cut. Knowing when is why cooking is a craft. Cut into squares in caramel size. If they are too sticky, you can cover them with a little icing sugar. Melt half the sugar and cook slowly until golden. If it gets burnt, throw it away and start over. Add the butter and stir it into the caramel. Mix in the cream, a little at a time, so the caramel does not clot. Pour the second half of the sugar in and stir until it melts. It is finished as soon as the sugar is dissolved. If it is too thick, then put in a little more cream, if it is too thin then boil it a little longer. If there are leftovers, you can just re-cook them the next to make caramels to between 125°C (257°F) and 130°C (266°F).